Two years ago, crowd-funding phenom Kickstarter launched with a handful of projects. Anyone with an idea for a film, album, art project, or product could make their pitch, say how much they needed to get started, and ask for pledges. Once the minimum amount needed was pledged, the project would get started. Today is Kickstarter’s birthday, and it is releasing some stats. That means Kickstarter projects overall have a 43 percent success rate, and 85 percent of money that is pledged ends up being collected. 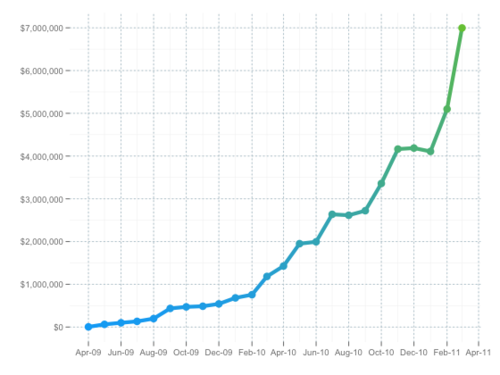 The money pledged on Kickstarter is growing steeply (see chart). In March, $7 million was pledged, up from about $5 million in February, and $4 million in January. April will be even bigger. The number of new projects also keeps on climbing. There are more than 2,000 projects added every month, double the rate a year ago. If 85 percent of pledged money is collected, why do only 43 percent of projects succeed? The answer is that more money goes towards successful projects. About a fifth of all posted projects, 21 percent, never receive any pledges at all. Simply finding one person who believes in your project enough to pledge some cash towards it is a good predictor of success. Projects with only one pledge have a 52 percent success rate. And projects which manage to reach 30 percent of the funding needed, have a 90 percent success rate. In the Founder Stories clip below from January, Kickstarter CEO Perry Chen talks about how projects like Diaspora (an open-sourced Facebook) or the TikTok iPod Nano watch take off on Kickstarter, and gives some advice for how to create a successful project. Update: More stats and pretty graphs on the Kickstarter blog.